This was an App prototype created for the North TX Apps Challenge. I was brought in last minute to do the design work for the score board, and ended up writing the code for querying the API on the backend to update the score board. We didn’t win the competition, but there is commercial interest in further development. 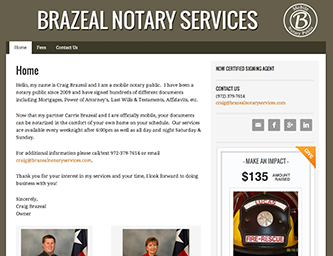 This website was created for a Mobile Notary. It is based on WordPress, with a customized genesis theme. Using WordPress allows Mr. Brazeal to log in and add or edit pages without looking at code. For a web programming class I took at Collin College. The class was divided into a couple groups to each create our own websites. I did the layout of the pages, including all the CSS and created a basic HTML template. The rest of my group did the research and wrote the content (the hard part :). 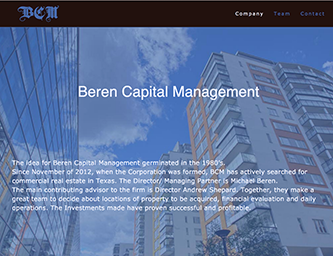 This was done as a single page website for a capital management group. All of the code was written by hand, based on Twitter’s Bootstrap template. It is mobile-responsive and the contact form sends messages via AJAX, so you don’t even leave the page when you press send!